Match the correct bead size and type to properly lyse or homogenize your material. Choose a pre-filled tube kit for Benchmark Scientific BeadBug, or Beadblaster bead homogenizers. Homgenizer bead packs comes in quantities of 50 or 250 tight-sealing tubes and in a variety of materials. Not sure which bead set works best with your material? Use this handy chart to identify the best match. Green Bead Lysis Kits are filled with a mix of stainless steel beads for buffer volumes between 100μL and 300μL. They’re excellent for small samples of tougher material like muscle. Navy Bead Lysis Kits are filled with a custom mix of stainless steel beads for buffer volumes between 300μL and 600μL. They’re great for samples too large for a Green kit, and deliver extra homogenizing power for challenging samples like bone, tumors, and hard-shelled insects such as ticks. 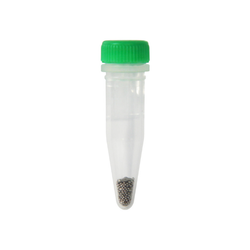 Red Bead Lysis Kits are filled with a mix of zirconium oxide beads for medium samples of soft material. 1.5 mL Yellow kits: Blend your bacteria better. Yellow Bead Lysis Kits are filled with beads selected for high yielding bacterial lysis. Ask for free samples! We're always aiming to please at Stellar Scientific.